Rutherford Pancake House is a storefront diner in Rutherford, NJ. It has a bunch of vegan options interspersed with loads of standard diner food. Apparently some vegans complained that the vegan menu was somehow "discriminatory" so the vegan options are now interspersed with the regular items. I personally don't see how this makes life easier for US but perhaps offers the non vegan diner a "hmmm" moment as they gaze through the options. Since almost all of my meals on the road are eaten out I crave some items that I have left far behind. One of them is a good vegan "mainstream" breakfast. When I'm home I do the green smoothies or hot cereal thing and on occasion will cook vegan chocolate chip pancakes for my daughter but for the most part vegan breakfast on the road is fruit and oatmeal and potatoes. That's what hotels serve as items that are accidentally vegan. Bread products are always suspect, (quay commercial bread has milk), and the only thing to put on them is peanut butter. To me that's lunch anyway. Waffles are usually of the "do -it-yourself" kind and I know there is milk and egg in the batter. Eggs are always out on the buffet line with either ground up or sliced dead animals so really, my options for the free breakfast, (or paid breakfast), doesn't usually include a delicious tofu scramble! Lo and behold Rutherford PH. and then the vegan "egg" mixture ... ya know, sometimes you just want to be cooked for. So once again, Lo and behold Rutherford PH. These first pics are from a lunch we had about a month ago and the second a few weeks ago. Yes, everything on this plate is vegan. I've had their vegan waffle and it was delicious but in the end it was still a waffle. I haven't had one in ages, and with the sausage and pure maple syrup was certainly a treat. Light and airy and all soppy with the syrup and Earth Balance. 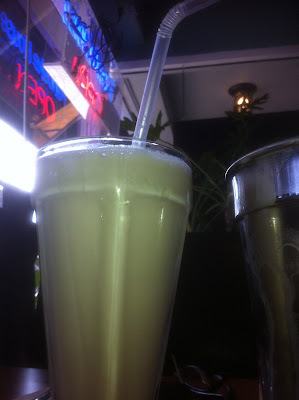 The soy milk shake was of course vegan and vanilla but looks green here for no apparent foodal reason. I'm sure there's a very good photographic reason. It was deliciously sweet and by no means anything but an excuse to have an ice cream like dessert in a glass. A wonderful beverage but Chicago Diner still has them beat. The vegan burger was alright I thought it was not a real replica of the patty I'm looking to, well, replicate. 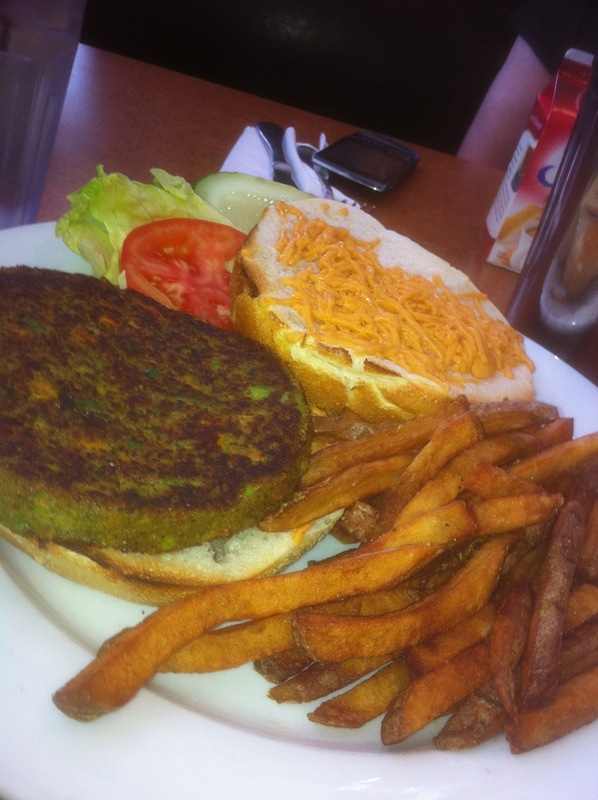 It was a vegetable patty. It was soft but so was the bun and the burger squirt was minimized and in my book most any kind of patty is better with Daiya. Now their fries are outstanding. They aren't the soggy pile of oil soaked potatoes many places put out but are deeply colored and nicely, (not overly), salted. Peeve: Why do you serve coffee with soy MILK and not soy CREAMER? It doesn't have the smooth fatty mouthfeel of creamer. Do I really need to bring my own? ... uh, well, as you can see in the pic below, I did. 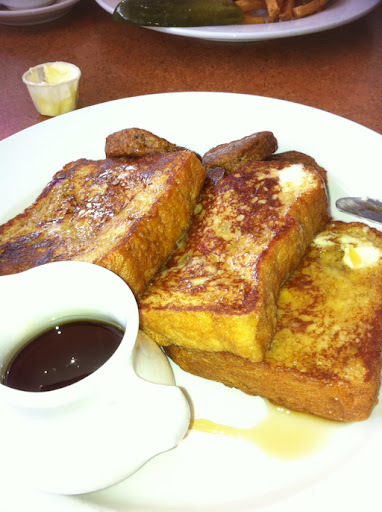 I vowed to return for the French Toast and about a month later we did. After I ordered I had one of those moments only a vegan can relate to after you think you have all of the non vegan ingredient possibilities covered and realized, "OH NO, WHAT ABOUT ... ??" That was the challah bread used in the French Toast. The waitress, who was working her first day, assured me that the traditional egg bread was indeed vegan and baked in-house. (Ahhhh.) It's also stated plainly on the menu that there are two kinds of Challah bread, one being vegan. Here'a a caveat, once again, to all of us who dine in "mixed" restaurants. Repeat-repeat-repeat the word vegan as an adjective to everything. As in, "I'd like the vegan french toast with the vegan sausage with the vegan butter type of spread with the vegan ... vegan ... vegan ... " Because although we had a great dining experience and our waitress had all the bases covered, vegan-wise, I've had my experiences where a runner put the regular sour cream on my vegan everything else plate. And when it comes, you guessed it, RE-verify. Here is my perfectly cooked vegan french toast with a rich eggy-ness soaked cooked bread that I oh so missed. The Earth Balance and pure maple syrup added the final touches in richness and caloric indulgence. Adding a piece of the vegan sausage with its salty fennel savory just sprang my mind back to the delicious and (yes, easier), days of pre vegan breakfasts. I like when a restaurant becomes a time machine. 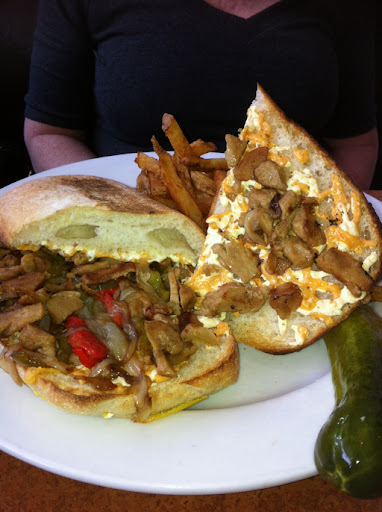 The other entree was the Seitan Cheese Steak Sandwich with sautéed peppers and onions and daiya cheese. I loved this sandwich. The bread was perfect and the whole thing held together. My only improvement would be the seitan be shaved and not in small pieces, more like the original it strives to emulate. I see the most interesting dinner options from a Seitan Marsala to a Vegan Moussaka. Since dinner is only served on Thursdays, Fridays and Saturdays and only after 5PM, (1700 in case another pilot stumbles onto my blog), it's going to take a bit of planning and some thought. Why some thought? Well, if I take someone who normally eats a SAD here they in all likelihood will order something from the animal side of the menu, something familiar, so I cause the use of animal products to be used in a meal. If they agree to go to a vegan place I'm assuring a compassionate meal for both of us. I learned several years ago you can't tell someone else what to order, especially if they are waiting for the familiar and take a bite out of seitan. The results are not always positive and I've possibly turned them off to trying something like that again. So that's the kind of thing I think about when I am sitting around an airport waiting for the rich and famous to return to their hired chariot. 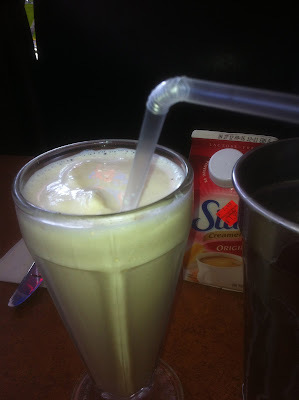 Rutherford Pancake House is a place I definitely will return to and hopefully soon.